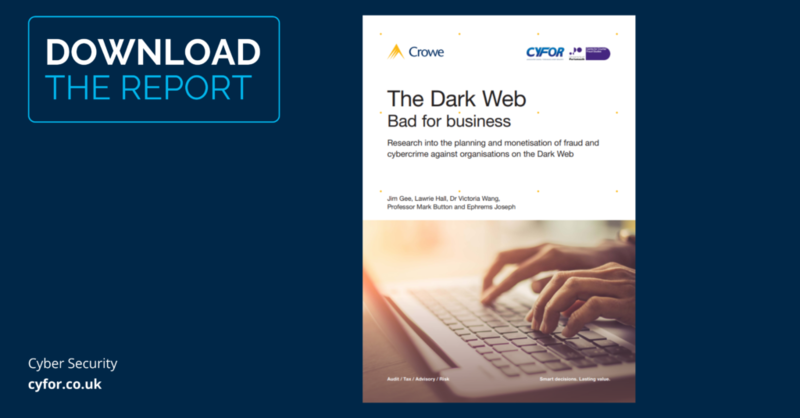 Crowe UK, in collaboration with CYFOR and the Centre for Counter Fraud Studies at University of Portsmouth, undertook research to find out more about how the Dark Web is being used by cybercriminals to launch cyber-attacks on companies. The Dark Web is a series of ‘darknets’ that requires specific software, configurations or authorisation to access. It forms a small part of the deep web, the part of the Web not indexed by web search engines, such as Google. The darknets which constitute the Dark Web include small, peer-to-peer networks, as well as large, popular networks like Tor, Freenet, I2P and Riffle operated by public organisations and individuals. The Dark Web is notorious for being a marketplace for illegal goods, such as drugs and weapons. However, the research underpinning this report originated in a desire to know more about how it is used by fraudsters and cybercriminals to support, plan, execute and monetise attacks on companies. The report contains research selected from the 50 most valuable UK brands and searched areas of the Dark Web called ‘Market Places’ for information about each brand. The researchers identified discussions, and attempts to market services and products, intended to defraud or perpetrate cybercrime against 21 of the top 50 UK brands, as identified the 2017 brand directory league table. For ease of analysis, the findings against the top 50 UK brands have been grouped into four key types of organisations. Out of the top 50 UK brands, eight banking and finance organisations were affected. Out of the top 50 UK brands, four retail and entertainment organisations were affected. Out of the top 50 UK brands, six telecommunications organisations were affected. Out of the top 50 UK brands, three energy and transport organisations were affected.